After an unusually warm November, New York delivered cold and crisp temperatures this morning, just in time for the first day of December. For a long time, December was, hands down, my favorite month; it meant, among other joys, winter break, birthdays, and decorating the Christmas tree with a hodgepodge of assorted ornaments. But over the years, it has lost some of its luster; the artificial Christmas tree was increasingly neglected and eventually thrown away, and when college ended, so too did winter break. Even so, December will always be a time when I actually feel happy about being nostalgic — nostalgic for all sorts of things, including but not limited to tried and true treats of the edible variety (ginger cookies and pumpkin-spiced everything) and classic stories (told by the likes of Dickens, Eliot, and Louisa May Alcott). There are many Beths in the world, shy and quiet, sitting in corners till needed, and living for others so cheerfully that no one sees the sacrifices till the little cricket on the hearth stops chirping, and the sweet, sunshiny presence vanishes, leaving silence and shadow behind. How nice it is to remember that one can always count on being able to sink back into the welcoming, cozy tale of the March sisters, just as one can bite into a ginger cookie and expect to taste molasses, every time. 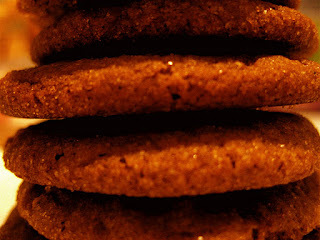 Chewy Ginger Cookies or Dunkable "Snaps"
Preheat oven to 350° F. Whisk together the oil, sugar, egg, and vanilla extract. Stir in the molasses. Mix the flour, baking soda, and spices together in a separate bowl, then add to the wet ingredients. Combine into a uniform dough. Pour about 1/3 cup of sugar and a pinch of salt into a shallow bowl or plate. Shape the dough into approximately two dozen tablespoon-size balls, and roll each into the sugar/salt mixture. Place the balls a few inches apart on an ungreased cookie sheet. No need to flatten the balls -- they should flatten into discs while baking. Bake for 10 minutes for chewy gingersnaps, or 12-14 minutes for "snaps" that are crunchy enough to dip. Remove them from the cookie sheet and cool on a plate or rack. Best enjoyed with a good book and hot mug of your favorite winter beverage. Incidentally, National Cookie Day is this Sunday, Dec. 4th! "If we had a keen vision and feeling of all ordinary human life, it would be like hearing the grass grow and the squirrel's heart beat, and we should die of that roar which lies on the other side of silence."